SeqGenome is a tool for browsing genomes and associated features, it can also be used in conjunction with SeqExpress to study correlations between chromosome location and gene expression. SeqGenome supports the loading of features from GFF files and alignments from PSL files. Data from any number of different files can be loaded, combined and browsed. To load a data file select the Open.. menu, and then choose the file to import. 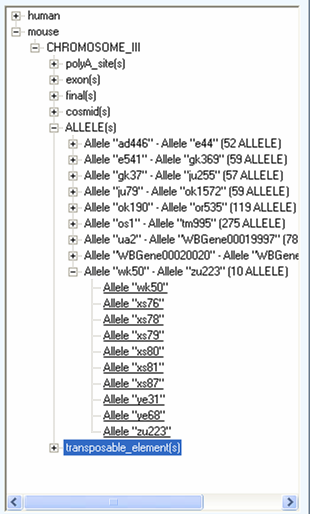 The file will first be indexed and then you can choose which chromosomes/contigs (e.g. chr1) and which features (e.g. exon) you wish to import. Depending on the specification of your computer, you may wish to NOT import all the features for the whole of an organism's genome. You can import more features from the same file (or different files) at any time. Once the file has been imported you are required to specify the organism it comes from, and then the results are placed in a tree on the right-hand side of the main viewer. The tree organises the information into species, then chromosome and then feature type. The features are then organised alphabetically into groups. Individual features can be selected and the information will be shown in the main genome displays on the left. The features can be navigated to directly using the tree on the right hand side or by directly selecting a region in either of the two genome visualisers (by drawing a selection box around the region of interest). Features that have been selected are highlighted in both the genome viewers, and are shown in the feature table on the right hand side. It is possible to adjust the layout of the features using a variety of options (see below), also tracks can be turned on/off using the checkboxes at the bottom right. 4) Features are split into different tracks depending on their type, within each track features at the same location are stacked on top of each other (unpacked and unmerged). 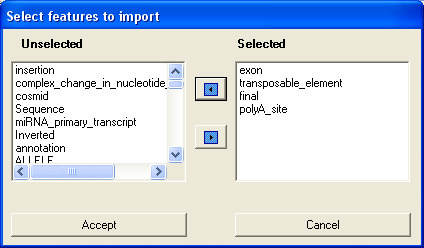 The different layout policies are available through the popup menu on the genome viewer(s). The popup menu can also be used to zoom in/out of the different viewers. The main visualisation component is com.seqexpress.genome.widget.MultipleTrackViewer and can be embedded (royalty free) in any application. The API offers control over the data to be visualised and the different layout policies. To get help on using the component in another .NET application contact me directly.